CAPE CANAVERAL, Florida -- Watch the launch of a SpaceX Falcon 9 rocket carrying an INMARSAT-5 satellite live online. The launch is scheduled to liftoff at 7:20 p.m. Eastern Daylight Time on Monday, May 15, 2017, from from Launch Complex 39A at the Kennedy Space Center in Florida. The launch window is open for 51 minutes. This is the fourth satellite to compliment Global Xpress' broadband constellation of I-5 satellites that operate in Ka-band to allow aviation, maritime, enterprise and government sector customers to have reliable and assured access to high-throughput communications. Built by The Boeing Company, the satellite carries its own propellant for final orbital positioning. Due to the heavy amount of fuel aboard the satellite (over 5,000 pounds of propellant), the total weight of the payload at launch exceeds 13,000 pounds. According to the latest launch weather forecast from the United States Air Force 45th Weather Squadron, there is an 90% of favorable weather conditions for Monday's launch. The primary weather concerns are cumulus clouds and anvil clouds. 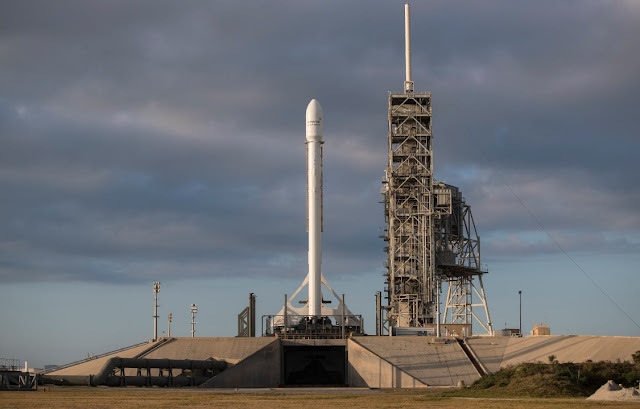 After launch, SpaceX will not attempt to land the Falcon 9 first stage rocket on land or sea due to the heavy payload that this mission will carry into space. Video and photo credit: SpaceX.